After a quiet first Friday session, the second ninety minute practice saw no less than three drivers crash into the barriers as they pushed for better pace. Kamui Kobayashi was an early casualty, crashing through the gravel trap and into the tyre barrier. 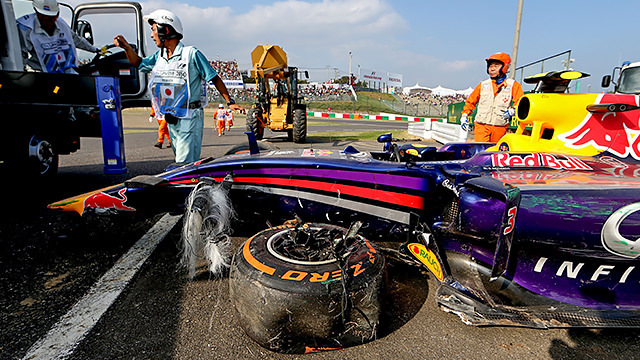 The Japanese driver was replaced in FP1 by a Friday driver, and didn’t see much of FP2 at his home event either. Daniel Ricciardo also found his way off track and through the gravel, running into the barriers and compressing the left hand side of his Red Bull as he came to a stop. Esteban Gutiérrez was the final driver to end his session out of shape, the car very much in pieces. Jean-Éric Vergne didn’t crash during FP2, but did manage to stop out on track twice, as the power unit in his Toro Rosso just didn’t want to run. Lewis Hamilton topped the times, despite his own scare. The Mercedes driver fought for control on the car after a significant wobble on one of his runs. He finished ahead of Nico Rosberg, although it was the other way round in FP1.